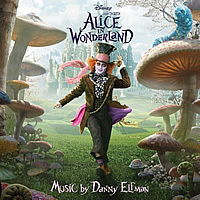 Danny Elfman was the composer who brought us on a wacky and outrageous musical journey to Willy Wonka’s madcap land in Charlie and the Chocolate Factory (2005). If your memory serves you well, the zany songs written for each of the spoilt kids (Violet Beauregarde, Veruca Salt, Mike Teavee et al) were wickedly fun treats for the ears. So it is no wonder that visionary director Tim Burton (no surprise here, considering how Elfman has scored his other films like Batman, Big Fish and Corpse Bride) gangs up with the Oscar nominated composer for his latest fanatical version of Alice in Wonderland. “Oh, Alice, dear where have you been?/ So near, so far or in between? You’d want to sing along with the jolly tune, and don’t worry if you can’t get enough of it, because in the five different reprise versions nicely spread throughout the soundtrack, you’ll find your head spinning with memorable melody. Elsewhere, it is standard Elfman fare if you are familiar with his orchestral style. From the nostalgically sentimental “Little Alice”, to the prim and proper “Proposal (Down the Hole)”, to the suspenseful “Doors”, Elfman is a spot on when it comes to telling a Burton style story. You can almost imagine the visuals unfolding in front of your eyes while listening to these cues. Also, listen out for the strangely hypnotic “The Cheshire Cat”, the ethereal “The White Queen” and the grandiose “Going to Battle” and “The Final Confrontation”, and you’d realise that this album is a complete package of several moods to portray the different story arches in the film. “Did someone pull you by the hand? /How many miles to Wonderland?